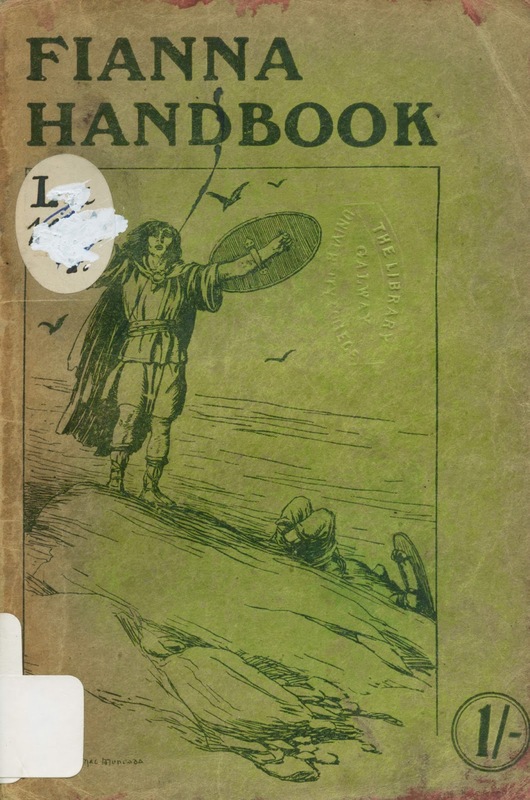 An item of interest to historians of numerous aspects of revolutionary Ireland will be this volume from the collections of the Hardiman Library - the Fianna Handbook, issued by the Central Council of na Fianna Éireann, the forerunner to the Boy Scouts of Ireland and published in Dublin by E. Ponsonby, Limited, 116 Graftom Street. 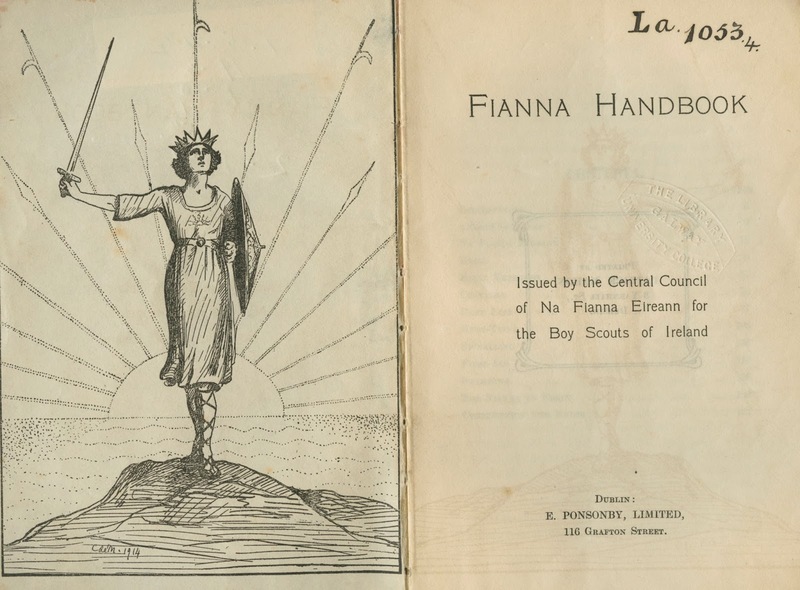 The foundation of this boy-scout movement can be traced back to prior the foundation of the Irish Volunteers, to 1913. Bulmer Hobson, having managed a successful version of the group in Belfast was keen, along with Helena Moloney and Seán McGarry, Countess Markievicz and others to recreate a new Fianna Éireann movement in Dublin in 1909. Though not clearly or directly indicated in the volume, the Handbook is thought to have been issued in 1913, which would again coincide with increased engagement and involvement with youth organisations and the formation of the Volunteers in that year and in the run-up to events such as the Easter Rising in 1916. 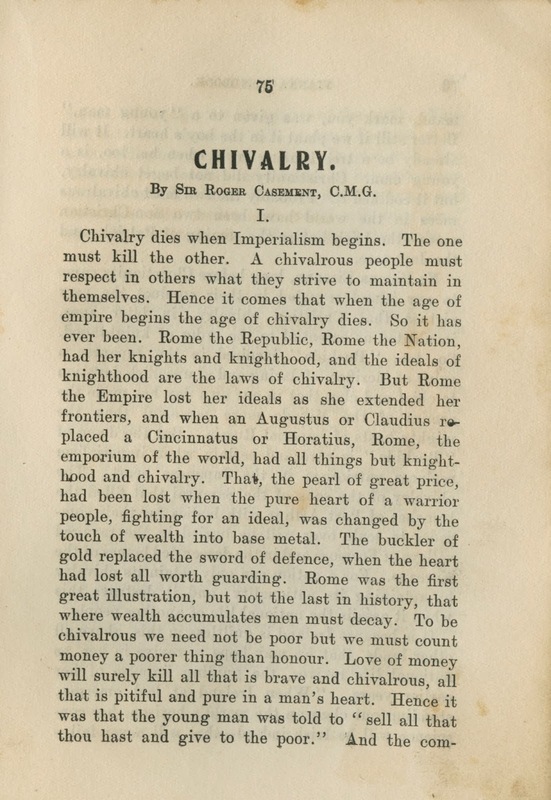 Though it is interesting to spot that on the inside front title page, the image on the left includes an artist’s signature of ‘C de M, 1914’, perhaps indicating this could be a later printing or edition. 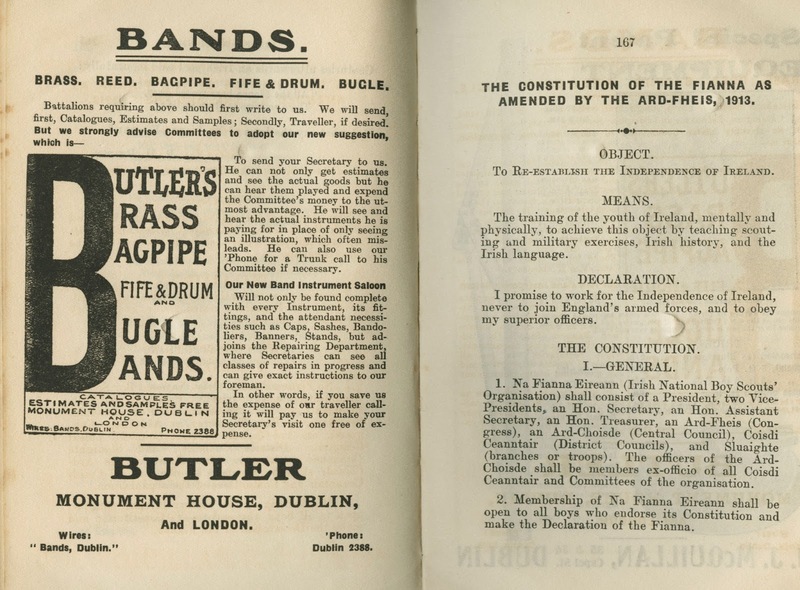 ‘Centuries afterwards an Irish poet said mournfully: “All the Fianna have passed away/There remains to them no heir.” – But what say the boys of na Fianna Eireann?”. 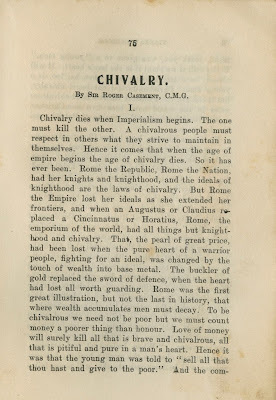 This volume is an incredible record of its time, when the leaders of this period and being contributors to this handbook were clearly focusing a lot of attention on the youth of the country. The AWC is now open. Drop in for some advice on essay writing. The Academic Writing Centre has just re-opened. Our hours are 11-1 and 6-8, and everyone is welcome. Bring some of your recent writing to the session, and we will take it from there. 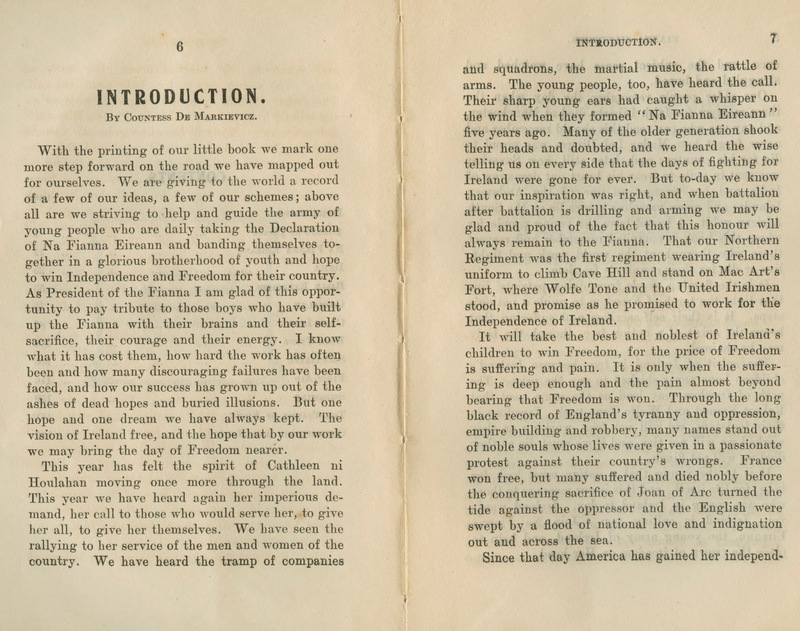 It has been a busy time of late with so many archive collections of the Hardiman Library pertaining to Ireland’s revolutionary period. 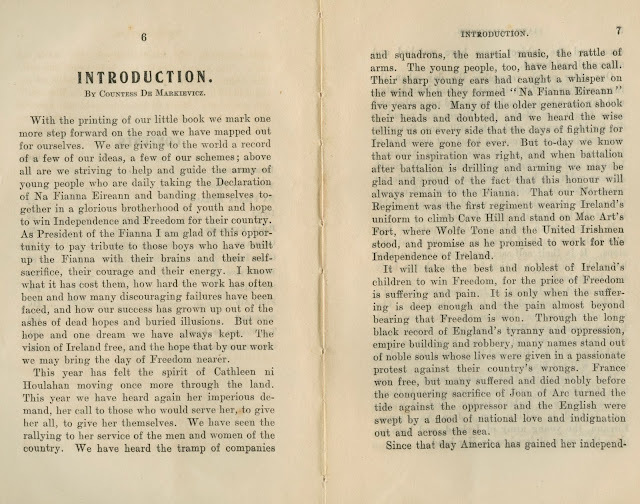 It will come as no surprise, being the year that it is, that material relating to 1916 has been so prominent in new publications and TV programmes of late. A new book by Dr. Fearghal McGarry, Abbey Rebels: A Revolution, Lost, was recently published and is a history of the varied and prominent roles played by Abbey Theatre personnel in the Easter Rising. The book features a chapter dedicated to Arthur Shields and exclusively reproduces high-resolution copies of many items from the Shields Archive of the Hardiman Library. You can read more about the book in its latest review. 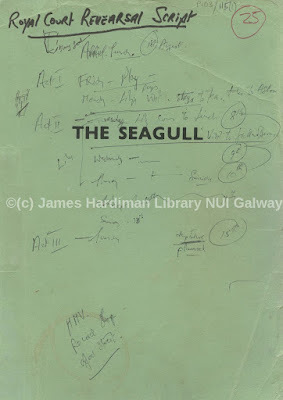 NUI Galway, in partnership with the Abbey Theatre has also made digitally available and fully transcribed, the minute books of the Board of the Abbey Theatre, 1904 - 1939, incorporating not just the Revolutionary period and the emergence of the Free State, but also spanning a major portion of the lifetime of poet and senator, W.B. Yeats, one of the co-founders of the Abbey Theatre. 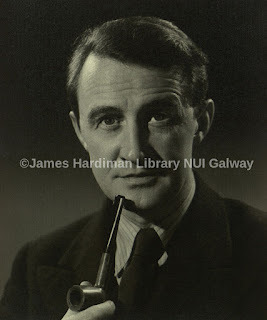 Throughout 1916 a series of major events will take place on campus at NUI Galway. A recent publication by NUIG 1916-Scholar-in Residence, Dr. Conor McNamara, is The Easter Rebellion 1916: A New Illustrated History. 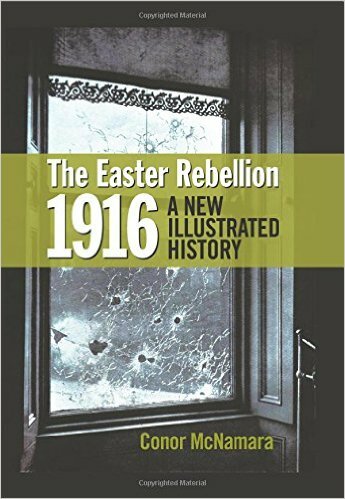 The book was singled out in the Irish Times as being one of the major publications of this time that revisits the complex history of 1916. 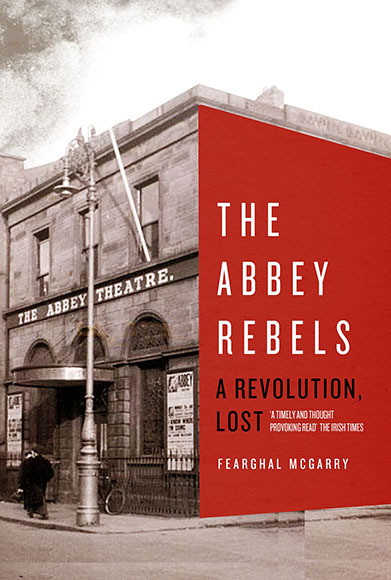 The book offers a visual insight into the events and aftermath of the Rising and you can see a selection of those images reproduced by The Irish Times. A major new exhibition focusing on the events of 1916 will also open in February 2016 at the Hardiman Research Building, NUI Galway. For a full programme of events for the NUI Galway 1916 programme, see A Nation Rising. All this came to the fore in a golden period at the Royal Shakespeare Company in the mid-1980s when he was a stubbly, neurotic Achilles in Troilus and Cressidaand a mockingly cynical Jaques in As You Like It. But it was his performance as the dissolute Valmont, successively in Stratford, London and New York, that elevated him to star status. Playing opposite Lindsay Duncan’s Marquise de Merteuil, Rickman conveyed both the lassitude of the practised seducer and the growing self-disgust of a man aware of his destructiveness." 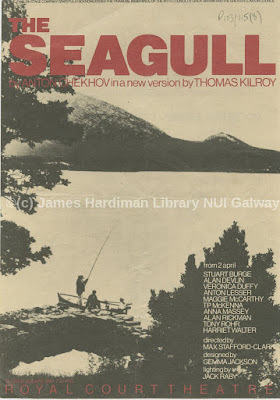 Poster from the Royal Court production of "The Seagull"
It was during this time that Rickman would perform in a play by Irish playwright Thomas Kilroy. Directed by Max Stafford Clarke, the play was premiered at the Royal Court on 8 April 1981. 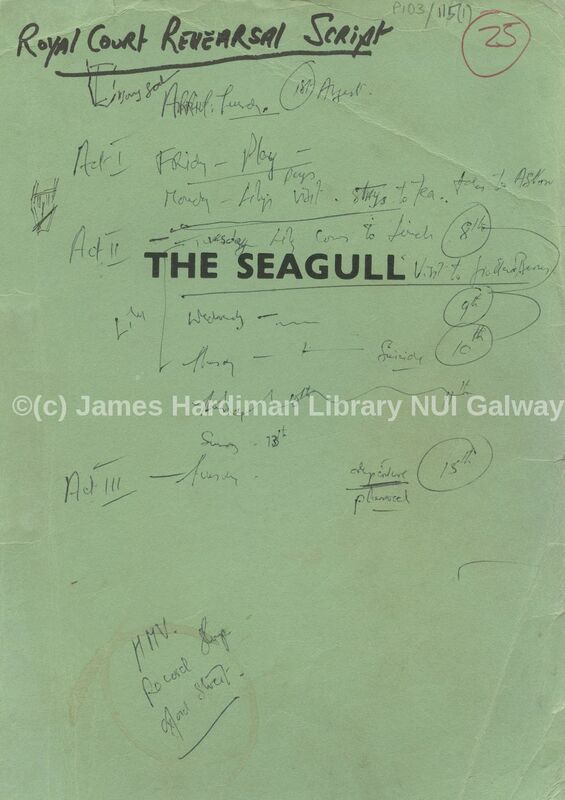 The play would have its Irish premiere, produced by the Irish Theatre Company at Siamsa Tíre Theatre, Tralee on 30th September 1981. The adaptation that Kilroy would write featured Alan Rickman as Mr. Aston and the cast would also feature Harriet Walter, Alan Devlin and others. 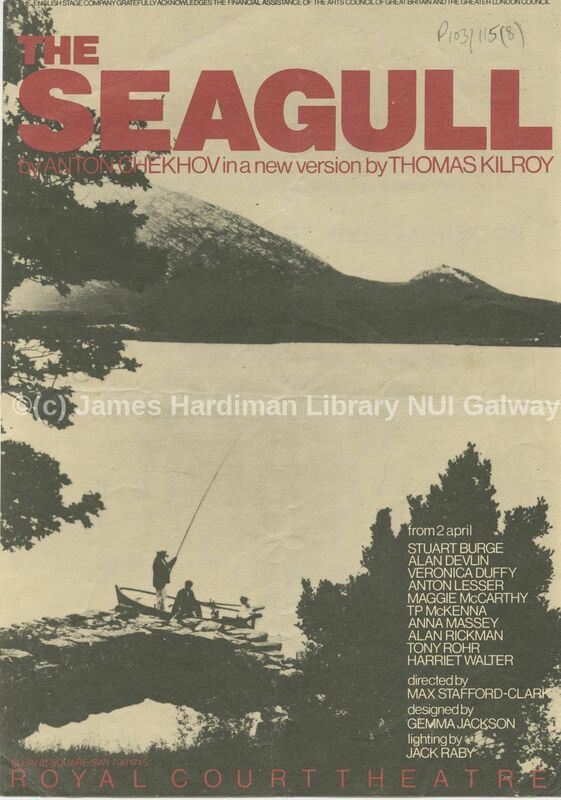 Within the Thomas Kilroy archive at the Hardiman Library, NUI Galway, the production files for Kilroy'sSeagull offer a wonderful account of the development, writing and drafting of the play that stemmed from Stafford-Clarke's single letter. 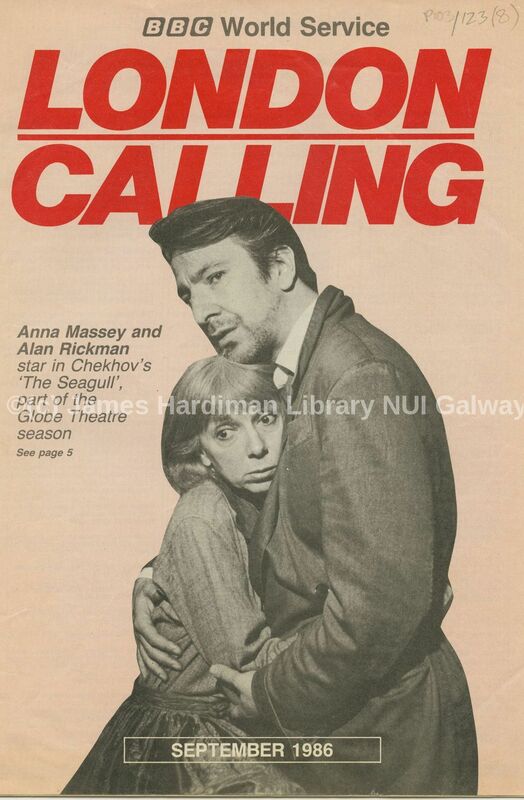 Billington would write in his 1981 review of the Royal Court London production: It is a fine performance superbly backed by Alan Rickman's Aston." Rickman's star ability to make any character and indeed any production his own and ensure it is most memorable for his audiences must be among the highest tributes for any actor. Both stage and screen will be far poorer with the loss of Rickman. The MakerSpace is now open. We have computers with design and animation software as well as Rasperry Pi's and Arduino starter kits. You can also see 2 of our 3D printers working in the MakerSpace. No booking required so just drop in and help yourself. On January 16, ProQuest will be upgrading its systems infrastructure to improve performance, security, and overall reliability of your products. The window is scheduled to begin at 03:00GMT and will last for 8 hours. Thank you for your patience; we apologize for this inconvenience.